I think this actress is just one of those people that inspires us all to keyboard-smash. She's so superlatively gorgeous and talented (and funny — did you catch her cameo on The Mindy Project?) and she's got killer style to boot. 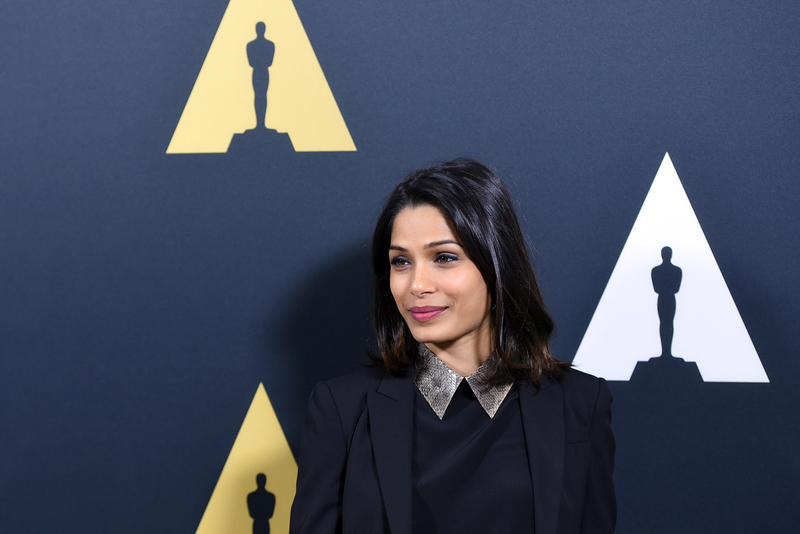 Most recently, Freida Pinto attended the Kate Spade Holiday Dinner, and she wore one of most awesome party ensembles from the brand that I've ever seen — and yes, that includes the two very fabulous outfits Anna Kendrick and Zosia Mamet wore in the latest #MissAdventure short. The Kate Spade-hosted soiree was held at the NoMad Hotel, in celebration of the (still rather far-off) holiday season, as well as the latest installment in the aforementioned #MissAdventure series — and fittingly, Pinto dressed head to toe in Kate Spade wares. Her ensemble featured a retro-mod shift dress, adorned delicately with rhinestone polka dots, and she topped the kicky-quirky party dress with an absolutely fabulous pale pink coat. Finally, she finished the outfit off with point-toe pumps (which matched the dress, with their sparklingly festive polka dots) — let's take a look! It's bit of an investment for one outfit (especially that coat — ouch! ), so here are a few more wallet-friendly options.